Former President of Ghana, Mr. John Dramani Mahama, has assured that he will be building an ultra-modern market for the people of Mankessim in the Central Region when the National Democratic Congress (NDC) takes back power from the New Patriotic Party (NPP) after the 2020 general elections. According to him, he is committed to putting up the edifice for the people of Mankessim to improve the lives of market women in the community. He believes it is one thing residents deserve and it has been long overdue. Hence he has promised to see to the completion of the project. It can be recalled that the flag bearer of the main opposition NDC made the initial pronouncement during his 2016 campaign tour in the Region. Having lost the election to the current administration however, his vision could not be realized. 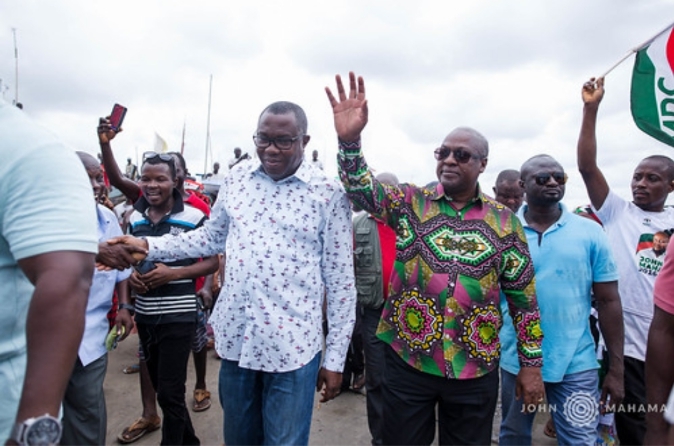 Speaking to market women on Thursday, April 11, 2019, as part of his two-day tour of the region, Mr. John Dramani Mahama, indicated that he had not forgotten his promise and will oversee the building of the ultra-modern market when they return to power in 2020. “I’ve not forgotten that we had a new design for the Mankessim market and we were preparing to construct a new market. We even put the design on display because when you talk of Mankessim, it is famous for its market, but unfortunately, we lost power. But when we recapture power in 2020, the market will be built”, the former president said. The ultra-modern market is expected to be one of the best in West Africa and once it is completed it will be named the ‘Mankessim Market’. The market will have spacious shops with a well laid modern lorry park among others.